At the moment here at DataSpace we are run off our feet with new enquiries and existing clients having a good sort out in preparation for the festive period and the New Year! We are also busy making tonnes of builder’s brews. I am even contemplating seeing what all the fuss is about and having a super strong cuppa with 10 sugars in! If you haven’t guessed by my not so subtle hint we have builders about (which very is very different to Beadle’s about). Our building work force are working hard on building a brand new DataSpace Archive Storage Repository! That means at DataSpace UK Ltd HQ in Wincham near Northwich there will be a total of 4 Document Management Repositories all on one site. Although we are all enjoying sporting the DataSpace Autumn/ Winter Fashion trend consisting of high visibility jackets, hard hats and a practical steel toe capped boot, what we are REALLY excited about is having another 600,000 cft of space! Like our existing facilities our brand new repository will have purpose built steel multi-tier racking, it”ll be compliant to BS5454 and will be monitored by online CCTV 24/7/365. 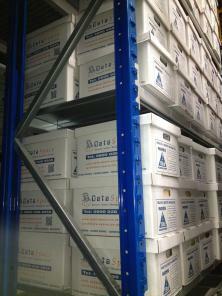 With the price of property increasing we understand the struggle to store your paper documentation in a secure and safe manner onsite, this is why we are increasing our facilities to be able to store even more of our clients vital and important archived and current documents in a repository they know they can trust.